Navaratna Gem Therapy Unheated Yellow Sapphire-Pukhraj-Flawless Like its planetary lord Jupiter. 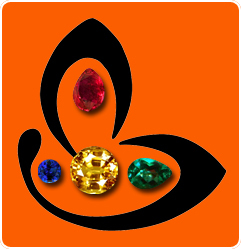 Comments Isn’t it gratifying to see the enthusiasm to implement gem therapy correctly to ensure the best results and alter the Karmik life map. Unique implementation of gem therapy taken to altogether another level with 3 super lustrous and rich golden colored, exceptionally clear fully natural and untreated Yellow Sapphires from Ceylon! No compromises on the quality of the gem ensures no compromises in the benefits of gem therapy! Look at the all inclusive price include 4 grams of hallmarked 22KDM gold and still if you cannot find a flawless gemstone that delivers flawless results something is missing. An exceptionally beautiful talisman filled with Sattvik energies and Jyotish powers! Have made a powerful talisman when set in this 22k Gold ring! Stunning color, eye clean clarity, fully certified as unheated with no treatment, fine rare sapphire from Ceylon and then you have a miracle of a beauty that will give matchless results and blessings of the planet of purity and knowledge-Lord Juipter. I want to purchase this yellow sapphire ring (size 6 US), do you have shipment to US? and can you make it size 6 US? and how many grams of gold ? what carat? 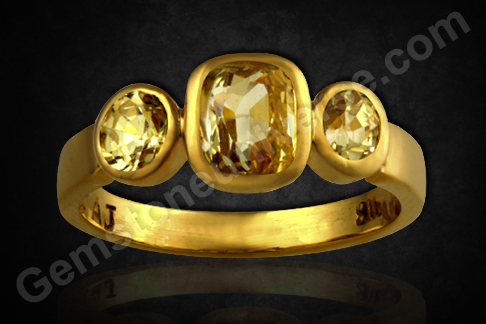 do you have one piece 3 ct yellow ceylon sappire? how much is the price?